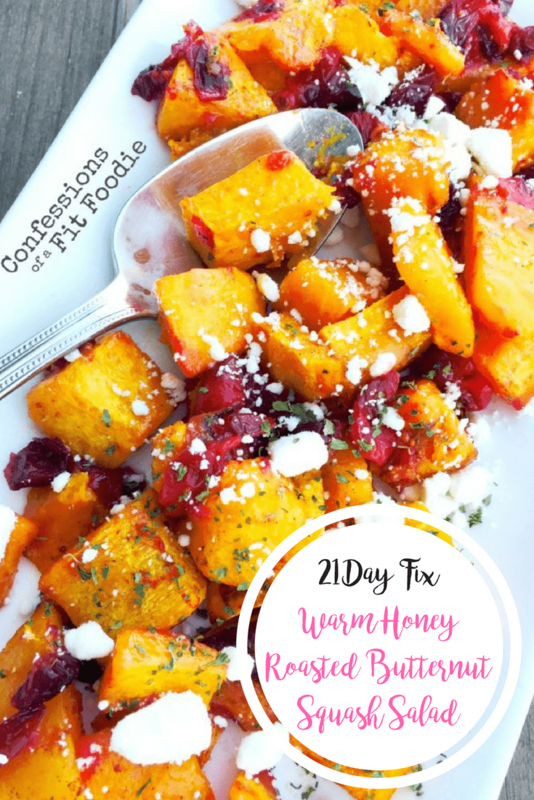 Warm honey roasted butternut squash salad is healthy and delicious. 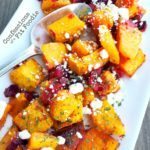 The squash is paired with tart cranberries and tangy goat cheese in this flavorful, warm side dish. 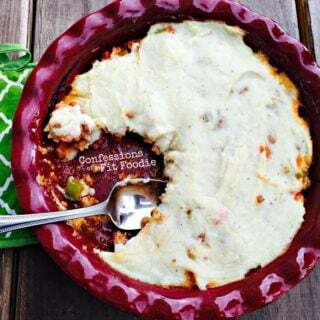 Confession #65 – This weekend, a friend of mine asked me what I do when I run out of recipe inspiration and find myself in a food rut. That literally never happens to me. I have the opposite problem, actually. My mind is always filled with recipe ideas. 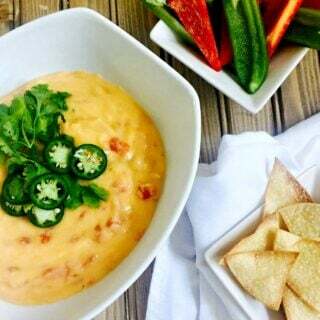 I dream about food, and sometimes I can’t sleep because I saw something on Pinterest I just NEED to try. And throw Thanksgiving into the mix, and I am seriously haunted by sweet potatoes and pumpkin desserts. It’s kind of a problem. I have too many Turkey Day ideas right now, between recipes I want to share on the blog, and recipes I want to make for my own family’s Thanksgiving. I can’t possibly make them all in the small amount of time I have to cook, take pics, and write up posts. I guess there is always next year. Anyway, this was such a festive and fun side dish, it will definitely be making an appearance on my Thanksgiving menu. You could sub feta for goat cheese if you prefer, but I thought it was perfect just like this! If you give it a try, let me know! Here’s the warm honey roasted butternut squash salad recipe. Enjoy! 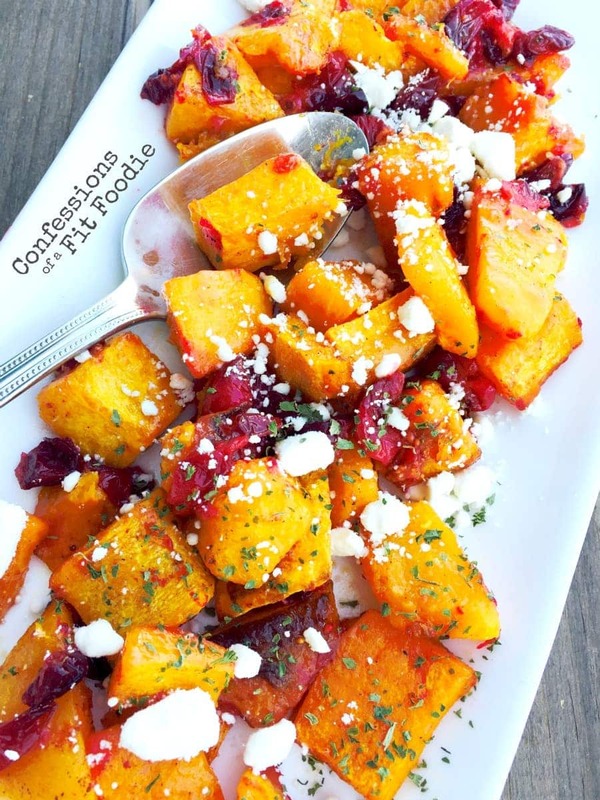 Butternut squash is drizzled with honey, roasted, and tossed in a warm salad with fresh, tart cranberries and tangy goat cheese. Spray a baking sheet with olive oil cooking spray. Add cubed squash to the sheet along with another drizzle of olive oil. Sprinkle with a light layer of salt, pepper, and garlic powder, based on taste preference. Roast at 400 F for 25 minutes on the center rack. 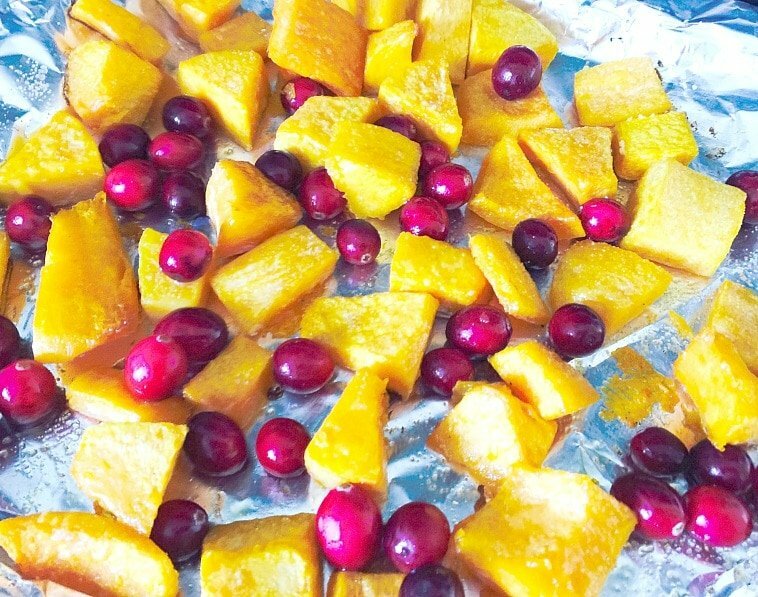 At the 25 minute mark, pull out the oven rack, and add your fresh cranberries to the roasting pan. Return to the oven for 10-15 minutes or until the cranberries have started to soften and burst a bit, resembling really juicy craisins vs fresh firm cranberries. Remove from oven and add a sprinkle of cinnamon and honey. Then gently mix in goat cheese. Garnish with parsley for some beautiful color and serve while it’s hot. Are you doing a round of the 21 Day Fix? Don’t do it alone – let me coach you! Contact me at trueconfessionsofafitfoodie AT gmail DOT com to join my current challenge group for daily motivation, recipe ideas, and the support of over 200 women. Check out my Etsy Shop for 21 Day Fix eBooks with full grocery lists, prep tips, and easy to follow recipes! Delicious, right? I love the addition of pecans to this one! Thanks for your comment :). How many butternut squash did you cut up to get 6 cups? Thanks! I used two large ones to get the 6 cups. 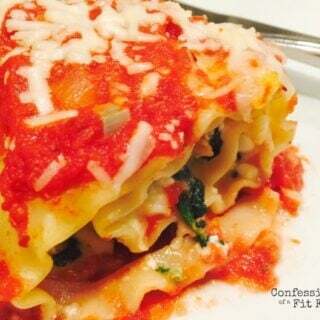 Do you have a recommendation for reheating? I’m making this for Thanksgiving and will be bringing it to a dinner. How should I go about reheating it? Thanks! Looks great. I can’t wait to try it! 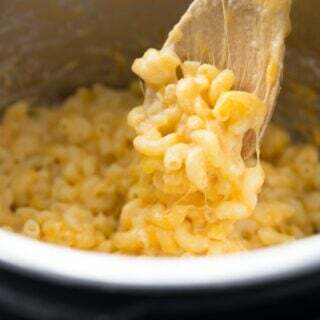 I would just warm it in the oven on a low setting (no more than 325) for a few minutes to take the chill out…it doesn’t need to be super hot and actually tastes better just warm. Wait until just before serving for the goat cheese! I’ll be doing the same thing! I have a bag of frozen butternut squash…the kind you toss in the microwave and steam. Can I use this for your recipe? would love to try your recipes. i’m a terrible cook because I have no vision. trying to get my family to eat healthier. we are a convenient family…..that means, packaged foods especially for lunch. dinners are always cooked…….not always good but cooked. I totally understand convenience! My advice is to pick one new recipe each week to try…use my recipe index to help you find something you and your family will enjoy!